Firefighters work to put out a fire at a Liberty, ME, manufacturing facility, which ended up a total loss. A Liberty, ME, manufacturing facility is a total loss after it went up in flames Sunday night causing several explosions due to hazardous materials inside. 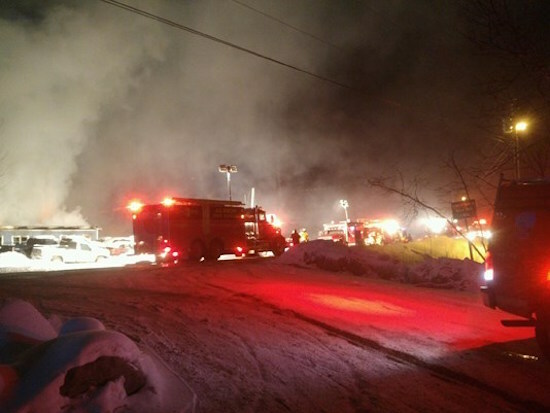 Truck accessory product maker, Magnum Manufacturing Inc. caught on fire at 7:30 p.m. Sunday night as fire crews from nearly a dozen towns responded to the blaze. One man, believed to be the person leasing the space, ended rushed to an area hospital with burns. Officials said they were non-life threatening. Firefighters battled some harsh temperatures making their efforts even more challenging. The State Fire Marshal’s Office is now investigating the cause of the fire.